Vegetable dyed Hand Loom Stole from the Garhwhal Himilayas. Versatile and attractive these stoles can be worn as a wrap around the shoulders or as a snuggly, warm scarf on a cold winters day. The beauty of theses stoles is that no two are exactly the same..... the dyes used are all natural, vegetable dyes which accounts for the variances that occur throughout, creating stoles unique in tone, texture and colour. 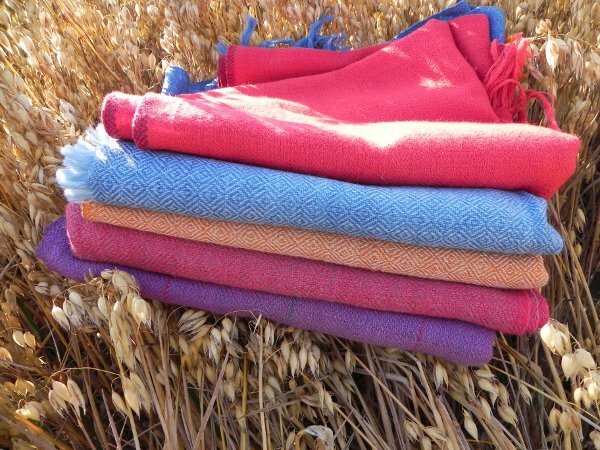 Stunningly beautiful these stoles are limited in quantity as each one is hand spun, hand dyed and hand woven to a very high standard, producing textiles of beauty, character and quality. You can find out more about how these stoles are made in our product background pages.